Enjoy an efficient full-body workout without heading to the gym with the Sole E95 elliptical trainer. Boasting a heavy 30-pound flywheel, a high gear ratio not found on most comparable models, and a pair of upper body handles, the E95 delivers an extremely smooth workout with plenty of top-end resistance. Users will also appreciate the unique oversize and adjustable foot pedals, which were designed in collaboration with a leading physical therapist and sports enthusiast. The pedals are not only extra large, but also feature a 2-degree inward slope that reduces the ankle and knee stress that's common in other elliptical machines. The collaboration also produced a revolutionary foot pedal angle adjustment not found on any other elliptical. Taking into account that not everyone walks the same way, Sole engineers made the E95's pedals adjustable to fit the way you walk. This also reduces the likelihood of numb toes and sore Achilles tendons. Workout specifics include 20 resistance levels, 10 total programs (including two custom and two heart-rate programs), and a 20-inch stride length. Perhaps the handiest feature from a user perspective, however, is the easy-to-use electronic console, which integrates a red/green display, a cooling fan, and a water bottle holder. Additional features include stationary handlebars with built-in pulse sensors for monitoring your heart rate; a heart rate chest strap for hands-free pulse monitoring; heavy-duty rails with smooth-riding wheels on the back; and a rear plastic shroud that adds additional stability for aggressive use. The E95, which offers a maximum weight capacity of 400 pounds, carries the following warranties: lifetime on the frame, five years on all parts and electronics, and two years on the labor. The E95 features an LED console to track your workout metrics. Sole brings over twenty years of treadmill and fitness product design and manufacturing to the table in their line of innovative equipment designed for fitness-conscious people. The company's treadmill line is simple in design, with an emphasis on quality and warranty all at a great price. Sole's easy-to-use treadmills offer a great value and feature a convenient, space-saving portable design. The treadmills have a very stable base with four wheels for ease of movement, folding decks to conserve space, and a 30-year motor and lifetime deck and frame warranty. Sole is always looking for ways to make their equipment better, more efficient, with higher quality at a great price. I have been researching these machines. I currently have a NordicTrack eliptical that has served my family well but its time for an upgrade. Heard a lot of good things about the Sole so I went to Dicks to try them out. As opposed to the one reviewer who did not like the thicker hand grips and the padded foot holders, I really LIKED them! This is a wonderful machine. It is solid. By that I mean that it makes me feel secure that it isn't going to topple--like a chair that is solid when you sit in it. Some chairs are unstable and not well grounded, but this machine is very stable. I use this analogy because there have been some elliptical machines that I have tried out that made me wonder if they were going to hold up or not. Another feature that I love about this machine is that it is whisper quiet. I love that feature! And it gives you a good workout. There are many settings to choose from. It has a fan (and I found it quiet too for a fan), and there are places for your water bottle, TV remote, phones or whatever. 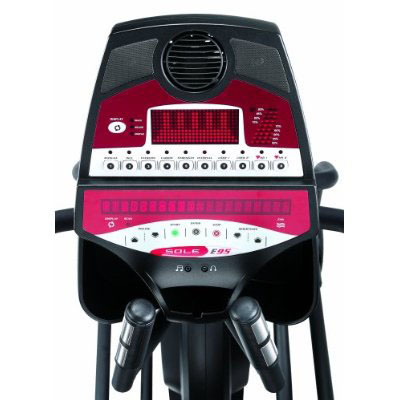 I find this machine to be very smooth also as I pedal it--and easy to use--meaning that I can control my speed or stop the workout in mid stride without punching buttons, etc., to make the machine stop. That is a nice feature for me since I am new to using an elliptical, and it is a very hard workout. I need to stop for a few seconds periodically and take a sip of water before I resume the workout. I feel that the workout I am getting exceeds my expectations. I feel that I can set my goals higher and this machine will be able to perform to those expectations. This certainly would be a wonderful machine for even an advanced person. I read the reviews on this before I bought it, and I am very happy that I took their advice and bought this machine. After doing much research for the right elliptical for me and finding glowing reviews from many fitness sites I settled on the Sole E95. I couldn't find one to try before purchasing, but I decided to go with it anyway and I've been completely pleased with this purchase. It arrived very well packaged, but as noted by others it is very heavy and the delivery man will probably not help you get it in the house. I opened it up in the driveway and carried it in piece-by-piece, only needing help with the flywheel piece. Assembly wasn't fun, but it wasn't the nightmare some other reviewers would have you believe. The instructions were straightforward and while the parts weren't labeled it was easy enough to tel what was what by the pictures. I did the actual assembly process without help and the whole thing from opening the box to powering up the machine took about 2 to 2.5 hours. Tip - If you have a socket wrench and/or electric screwdriver you will speed the normal process up considerably. Using the machine feels so good! One reviewer states that it's not good for tall people, but I'm 6'5" and it feels very natural and smooth to me. It has many different programs for a large variety of difficulties which will help keep you interested and challenged. The controls are easy to use and the buttons for the incline and difficulty level are very conveniently placed to make it easy to change the workout whenever you feel like it. One of the best features is the wireless heart rate monitor which helps you control the pace of your workout and keep your heart rate where you want it. This machine is almost completely silent! You won't have to turn the volume up on a tv at all if you choose to watch it. The padded footpads feel great if walking bare or sock-footed, and keep you slip free if wearing shoes. The hand grips also feel great and are easy to hold for long periods, but they might seem a little large if you have small hands. It's also a very sturdy machine and holds my 270 lbs without a single bit of trouble. The speakers for the MP3 player are OK. Nothing special, but good enough for most people. The fan, as many others have noted, isn't worth much but it's better than nothing. It comes with a little water bottle and includes two spots to hold it or other bottles. All in all, this is one great machine! After only a few days of use you will start to tell a difference and feel better. And when you add on the incredible warranty (you won't find a better warranty for an elliptical) and features it's hard to believe that this machine doesn't cost much more. I think you will be pleased with this machine. Thank you for your time. 2 year parts, 5 year labor, lifetime frame, 20" inch stride, 400 lbs weight capacity, in home service. Need I say more! The type of warranty is usually a pretty good indication of the quality of a product. Of all of the machines I researched, including the higher end commercial models, none of them provided a better warranty. This is a great machine! ~4th call - was told they would ship replacement parts would arrive in a week. ~Week later rep. called wanted to know what the problem with our console was as though we should know...said he'd ship out the parts and would be here in a week...guess we'll see. ~3 hour assembly time with the worst instructions...very unclear...you should have some mechanical apptitude otherwise you might be in trouble here and put it together wrong. ~Customer reps. are totally aloof when dealing with you as though you'll get your parts when you get your parts and they don't give a f... "it's against company policy to ship next day"
You'll work up a sweat with this baby! I can't add much to the previous excellent reviews, but I will add my thoughts. WARNING: Take ceiling height into consideration! I had planned on installing it in my basement which has an 84" ceiling. It ended up in my garage with a 91" ceiling, less 1/2" for the matting. My height is 5'10" (70") and the 90.5" garage feels comfortable using the elliptical. Much less than that though, and it wouldn't be comfortable at all. I would say to add at least 17" to your body height. On assembly: Not too bad. As someone said, if you can assemble complicated Ikea furniture, you can probably handle this. There are LOTS of parts. The rubber grommets for one of the steps were with the power cord, other than that, all the bolts and washers are separated in a tray by the assembly step number. Positives: Very solid. When using it, it only very slightly wobbles and that's because it's setting on 1/2" foam matting. Once I move a light fixture out of the way, I'll probably move it over to the edge and remove the matting from under it. Very quiet and very smooth. Negatives: At the lowest level, it provides probably too intense a workout for some folks. For me it's fine. This morning I did the interval with a max level of six and it was no problem. (I'm not exactly Mr. Buff.) For my wife, who doesn't do much physical exertion, after 5 min. on level one, she was back to walking on the treadmill. So I'd say if your normal exercise is walking, then you may need to work up to an elliptical. Audio speakers are *tiny*! Also tinny. Rather like the audio from an old transister radio. Usable in a pinch I suppose, but I wouldn't count on them for a pleasurable workout experience. It has two "user" memory storage buttons that are virtually worthless. You can, step by arduous step, program a specific workout with twenty different segments!!! if you like, but it's hard to imagine real people using this feature. I would much rather have two buttons that memorized two different people's weight, age, etc. As it is, if two people alternate on it, you have to enter all the information every time you use the machine. Fortunately for me, it looks like it'll be a while before my wife gets back on it. I think the built-in profiles are adequate, although I wish they had a profile with continuous random "hills" of various heights for more diversity. If you want a non-impact full-body workout that can raise a serious sweat, with the possible exception of a rowing machine, you can't beat an elliptical. All in all, I'm glad we bought it. Edit: I wanted to add a few more positives. I like that the foot pads are adjustable. You can't even tell that they're "padded" - not sure why they market that "feature", but the pads don't appear to be easy to wear out, which is a good thing. After using it some more, I can tell that I need to adjust my height recommendation. If you're going to use the Incline feature, (where the back rails lift the foot pads higher when they're in the rear position), then you'll probably need 18" or 19" above your height. When the Incline is at the highest position, my head doesn't hit the 90.5" ceiling, but it's pretty darn close! Don't let my thoughts on the resistance at the lowest level disuade you. It's very likely to be that way for all ellipticals. See if you can get a trial membership at a gym for a day to try an elliptical to see if it's too much for you. Great gymlike elliptical for your home! Very good machine, feels like you're at a health club. We ordered this as part of a new year's resolution. The delivery company is only obligated to drop it at curbside, so be forewarned. The driver was nice enough to help us get the huge box (about 8' x 3') in the house and we tipped him $10 for his trouble. One of the reviewers mentioned assembly being a nightmare and taking 5 hours. That wasn't the case for us. I'd say it took us about 2 hours or so, but the whole process went smoothly and the instructions were easy to comprehend. The machine has a 20" stride length, but that's plenty for us (I'm 6'1") and a lot of nice features. It keeps track of your pulse, has two built-in speakers and an input jack for your MP3 player. There's even a fan. Programming is a snap and there are two separate profiles that you can store your vitals in for ease of use.